Looking for a GMC body shop you can trust? Triangle Collision is a member of the Assured Performance Network, meaning that all of our GMC repair processes, tools, and technicians have been approved by the GMC manufacturer. Our customers know that their vehicle is in good hands, and we go the extra mile to make the repair process as hassle free as possible. If you live in the Morrisville or Cary area and have a GMC vehicle that was involved in an accident, contact Triangle Collision at (919) 460-7693 or fill out our form! We understand that your GMC is a significant investment, and are confident that you will be satisfied with the quality of our service. We offer Lifetime Warranties for our repairs and paint services. This way you can rest assured that your vehicle will be repaired to pre-accident condition. .
What can a GM Recognized GMC body shop offer that other shops can’t? We can back the work of our technicians with a 100% customer satisfaction guarantee. This is because we have gone the extra mile to equip our shop with GMC approved tools, and have put our technicians through extensive GMC factory training. With these things, we can guarantee that your vehicle will be repaired using the same techniques that were used when it was originally assembled in the factory. All of your performance and safety features will function as they were designed to. It’s your choice, not the insurance companies, where your vehicle is repaired. 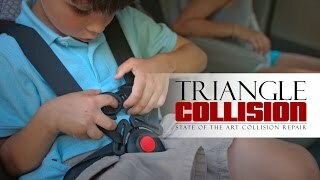 Choose Triangle Collision, the Cary, NC area’s premiere Cadillac Body Shop & Collision Center. The safety of our customers is our number one responsibility as a GMC body shop. Which is why we are dedicated to repairs that never cut corners and strictly follow GMC factory guidelines. In order to achieve safer vehicles, GMC has developed unique designs and technologies in order to better protect their customers in the event of an accident, or to help prevent accidents from happening. During a repair, it is important that we calibrate these systems exactly as they were originally calibrated in the factory. Not only will your GMC be safe to drive, but it will look just as good as it did when it left the dealership. Our technicians have access to BASF technologies, which lead the industry in automotive refinishing. All dents, scratches, and other discolorations will be erased. On the inside and out, there will be no sign of the accident. Let us take the stress of dealing with the insurance company off of your hands. We understand the claims process and will work with the insurance company to get your Cadillac back to pre-accident condition.